What happens when a former loan officer—yet another victim of the mortgage crisis—rejects materialism and moves to a one-room cabin in the woods? In the case of H.T. McMullen, the reluctant hero of Naked and Hungry, my darkly humorous suspense novel, he finds his favorite fishing spot tainted by dangerous pollutants. When he dares to complain he finds himself the target of a murder plot. And the only woman who can save him has a dangerous secret of her own that soon catapults them both into a fight for their lives. Reviews from Barnes and Noble. Willow Creek Rotary Club Bulletin, August 2011. Download a printable flier from Ingalls Publishing Group. 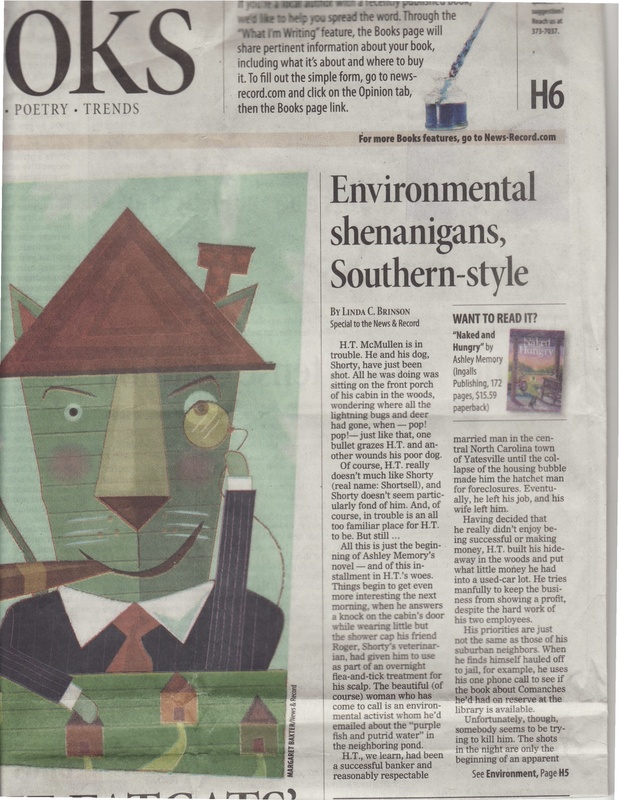 Read a review by Jeanne Jenkins of The Happy Bookers Book Club in Lakeland, Fla! About Henry Thaddeus (H.T.) McMullen The character of H.T. and his unique philosophies are inspired by my father, the inimitable J. Gale Thomas. Like my dad, who has undergone several major life changes, H.T. is also re-inventing himself. In the wake of his divorce and the loss of his cushy banking job, H.T. has turned to a more modest career, that of a used-car salesman. His only obsession is his precious Harley-Davidson: a 2001 Road King Classic. In his second life, he has no intentions of accumulating any wealth. The conflict between H.T. and Margaret, his bossy young office manager, speaks volumes about his newfound independence. When she presses him to make some minor improvements for the sake of business (such as changing his T-shirt), he quickly chides her. “You’re forgetting that I’m not here to make money. There’s only so much success I’m willing to take on.” It’s this laissez-faire attitude that liberates him, and at the same time, makes him vulnerable to the capitalist forces closing in around him. When H.T., a man with a net worth of negative $543, refuses what amounts to a pay-off, the villains are perplexed, asking themselves: “What kind of man refuses cold, hard cash? He’s a strange ranger.” Indeed. Julio Ramirez, H.T.’s mechanic and the man who helped construct his quirky little cabin. He’s a genius with cars but his libido is racing out of control. Ever wonder what’s happening to our small towns? In North Carolina, where urbanization is sweeping across our landscape like one of those self-propelled robo-vacs, our small towns are on the verge of extinction. If there is no tourism or large-scale industry, their main streets are a pastiche of floundering businesses or boarded-up storefronts. It’s heartbreaking, yet at the same time, quite uplifting to see how enterprising citizens abandoned by their government or long-time employers manage to keep their hometowns alive. In the case of the fictional town of Yatesville, the setting for Naked and Hungry, the major employers have all fled to Mexico in search of cheaper labor. The townspeople have resorted to some unorthodox–and occasionally illegal–means to earn a living. The town’s struggle makes for a fascinating backdrop to the novel, and one that has already inspired, you guessed it, a sequel or two. 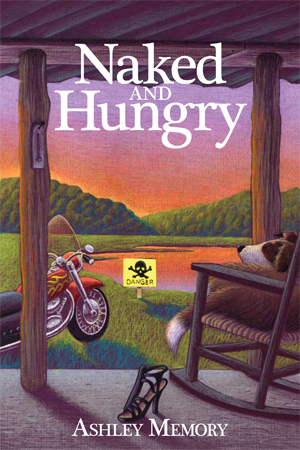 Naked and Hungry was published by Ingalls Publishing Group in Boone, N.C. in November 2011 and is now available for purchase through your local bookstores or online booksellers. Order Naked and Hungry from Amazon. Order Naked and Hungry from Barnes and Noble. Having had the honor of being one of the first to read your manuscript – let me also be one of the first to congratulate you! As we’ve discussed I found the book to be highly entertaining; I often found myself laughing out loud! The tale was artistically spun and drew me in from the get go. The realness of your characters maintained a believability throughout the novel. Kudos! I can’t wait for November 2011! Congrats, Ashley! I am so excited for you – and for H.T. and this cast of characters to be introduced to the wider audience they deserve. November 1 will be here before you know it! I’ve set my calendar reminder on Outlook. Here’s to hoping that I should I part ways with my current employer that I have a mental recollection of the release, which I’m rather sure will be lauded by others throughout the state much closer to November 2011. As a resident of the Tar Heel state and Western North Carolina as of late, I can certainly see aspects of these characters’ descriptions in the faces of many North Carolinians. And I cannot await the date they come alive on the pages of Naked and Hungry. Congratulations on the contract – I’m looking forward to getting to know H.T. Thanks all, for the kind comments. Heath, not only does H.T. indulge in the occasional Krispy Kreme, he is a big fan of that Southern standby, strawberry congealed salad. And the best part for the last…he’s a graduate of Western. Congratulations Ashley! How exciting for you. November will be here so quickly and your awesome novel will take everyone by storm. You will soon be added to the list of great North Carolina writers! NC residents will have a fresh new voice for their small towns and its quirks. Thank you for writing such a well thought out and current novel. Do you think I could get a signed copy? You got it, gal! You’ll one of the first! Congratulations, Ashley. As you know, Robert and I work together every year in the Command Center at Carter Finley Stadium during home Wolfpack football games. Robert mentioned that you were writing a novel, and I was intrigued. Through Robert I had the privilege of reviewing a version of the manuscript of Naked and Hungry early on. I enjoyed the read and look forward to reading the finished product when it is published. I hope you will autograph my copy. Football season is almost here and I look forward to working with Robert again this year. That is awesome Ashley! Many congrats to you! It will be on my “to read list” and you’ll have to sign it for me. Ashley, I cannot wait to read this! I imagine a great deal of it will be familiar to me, as your muse and his life have been a part of my life for quite some time! This is so exciting! Dorothea Benton Frank wrote her first book because her husband would not give her the money to buy her deceased grandmother’s beach house. 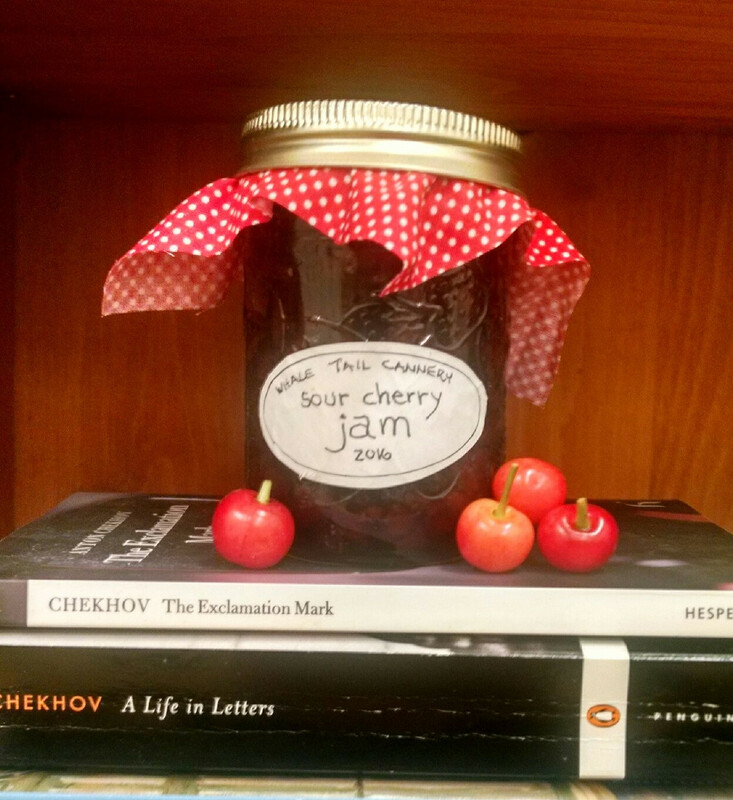 She told him she would write a book and buy it herself…and she did! You’ve always had a book in you and now it has escaped. It is a festivus miracle. Please do not forget all the “little people” in your life who have stood with you. H.L., I am so honored! A comment from a true master 🙂 Seriously John, thank you SO much; you have been a great friend to me. You will definitely have one of the very first copies. Congratulations! I am so proud of you and can’t wait to read your creation. It sounds great! Congratulations Ashley. I’m looking forward to reading your book and having a famous relative! Karen and Bret, thank you for your support. I just hope Knoxville is ready for the antics of H.T. McMullen and gang. Love to you both! See you soon! Congratulations, Ashley! I’m so excited for you! I can’t wait to read it and I definitely want a signed copy too 🙂 You really inspire me to keep on writing!! I cannot wait to read the rest of H.T.’s story. I am also glad that you chose to keep the setting here in North Carolina. I was born and raised in a small North Carolina town and every time I go back to visit, something has changed. It seemed that for years…nothing ever changed! I am very eagerly awaiting the release date! Alicia, thank you for this sweet comment and for signing up for the notification list. And I will happily sign a book for you! I, too, grew up in a small town, Asheboro, which served as the inspiration for the fictional town of Yatesville. Seems I was always making up stories when I was little, so I really enjoyed the opportunity to bring a community of “grown-up” characters to life. I do hope you like the book. And I look forward to watching you continue to make your dreams come true! Oh Ashley- congratulations!!! I cannot wait to read it! May I suggest that upon the release, we celebrate together over a bottle of pure vanilla! Good times, sweet memories! Cindy, thank you! What a great idea. But we don’t have to wait for the release to drag out the “good stuff!” We’ll celebrate when I see you again–maybe with a vanilla martini! Lord, I miss that snow cream, and you, too. We’re so proud of you! Can’t wait to read it. Buy your beach house at OIB. Hayes, thank you. You are so sweet! I enjoy hearing about your successes. I know that even greater things are in store for you because you know how to make things happen! I am bitterly disappointed that it didn’t come out THIS November. I was so ready to give it as a Christmas gift this year. Callie, I’m so sorry! Me, too 🙂 There are a couple of books ahead of me on the landing strip so it takes a little time. But I promise to keep you posted! I look forward to reading this book. Although, I enjoy reading on my Kindle, I would be honored to have you sign my hard copy when I receive it. You are a sweetheart. I promise that you will have one of the very first copies–autographed with a very special inscription. When it’s ready, later this spring, I’d love for you to be a reviewer for the second book. Then you and SB will be equal! I loved what I read it is just up my ally. I love suspense and I would like for you to sign my copy when I get it. It would mean alot to me. Contgratulations again on your success!!!!! I wil happily sign it! FYI — I will have advance copies soon, so if you know of any book clubs or other gatherings that might be interested in hearing about it, let me know and I’ll see if they would like me to speak about it. If you go to Meetup.com and put in book club and your local zip code you will find a large list of book clubs along with the person who runs each one. Donnamarie, thank you! That will help tremendously. I am soooo proud of you. Wow, I am excited and happy that your hard work is now showing the world how talented you are. Kathryn and I may have to skip school in the fall to come visit a “signing”? Mmmm. What a sweet message. Would love to see you and Kathryn — I’m hoping to have an event sooner than the fall so maybe you both could come sooner. 🙂 I hope all is well with you and all the Sullivans! Definitely rates a 5 out of 5 stars! Dani, I’m so glad! The fact that you’re an avid reader–and a mystery buff–makes your comments especially joyful to hear. It also makes working on the next edition even more fun. Stay tuned for more of H.T’s adventures–including a skunk encounter, tractor pull, and a medieval-themed exotic dancer. Hope to see you guys when I comet o Charlotte in the near future. I absolutely loved Naked and Hungry. From the moment that I read the first page, I was hooked. It was a fast read (I am a very slow reader, but I just couldn’t put it down). H.T. was sitting on his front porch with his dog Shorty, and was aware that they had both been shot. He certainly did not know what was going on, so what did he do, he found his toolbox and got his gas-powered King Ram T-200 nail gun! Don’t you just love it? Any self respecting ‘good ‘ol boy’ in North Carolina would have had a hunting rifle, but H.T. grabbed a ‘nail gun’. I loved that it had a bit of a love story. He met Jessica Beane who worked for the Grassroots Environmental Coalition. Jessica tracked down H.T. through an email that he sent about purple fish that he found in a pond that was near to where H.T. lived. Then everything gets really complicated! So much for the relaxed, private live that H.T. thought that he had. At one time H.T. was arrested and put in jail. He was advised by sheriff Wayne that he had one phone call. Did he call his lawyer, girlfriend, mother or a friend? No, he called the Winnabow County Library to see if the book that he had on reserve, My Comanche Moon, had come in yet. Since I am a book lover, I totally understand why he made that phone call. I loved the characters in the book, but my favorite was H.T.’s mother Myrtle. She always had Bermadean with her, which was a goat that always wore cute little outfits. I could go on and on about the story, but this is a book that you need to read yourself. You will find yourself smiling, laughing out loud, and just enjoying the people, place, and plot of Naked and Hungry. This is absolutely the most fun book that I have read. Good news everyone, I have it on good authority that there will be another book that features good ‘ol H.T. I will save a special place on my book shelf for Ashley Memory books. Judy Geary is a close friend of My wife and I. She suggested I read your book. I am an eighty one year old voracious reader (careing little for television) usually reading two or three books at the same time. Janet Evonovich is one of my favorite authors and when she was here in Nashville a couple of years ago for a book signing we were able to talk a bit. Keep up the good work and perhaps some time when we are visiting John and Judy I will get to meet you. Again thank you for writing such a delightful story. Ollie, thank you so much for the kind comments! I am so glad you enjoyed the book; I always appreciate hearing feedback from serious readers! I know you have high standards.